Vermont Day-cations: Saxon Hill Trails & Fort Ticonderoga | Features | Kids VT - small people, big ideas! School's almost out, and "Day-cations" are in. 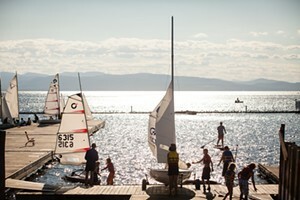 Every summer, Kids VT seeks out family-friendly destinations where you and your kids can experience the natural beauty and unique culture of the region. They're all places you can visit with your kids in a day. Each of our three summer issues features two recommended trips, complete with tips on nearby dining and attractions. 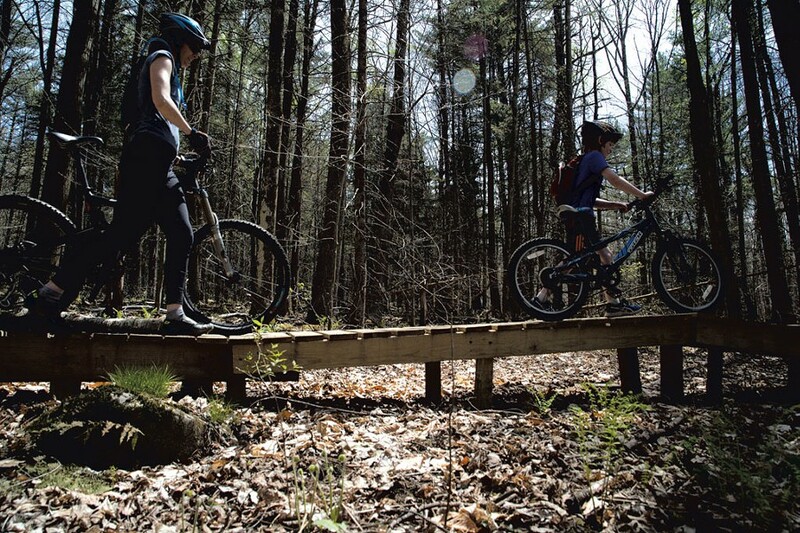 This month, contributor Becky Tharp takes her family on the bike trails in Essex, while executive editor Cathy Resmer accompanies hers on a journey back in time. Looking for more day-trip ideas? Read the rest of our award-winning Day-cation series. My husband Gabe and I fell in love while riding bikes. In our early twenties, we filled two bike trailers with our belongings and hit the road on old, steel-framed road bikes. We were winding our way from our home in northern Colorado to the California coast. When we arrived in Santa Cruz, we learned that there were three of us — I was pregnant with our first baby boy, Kieran. Like most parents, we dreamed of sharing our passion with our kids as soon as they were able. 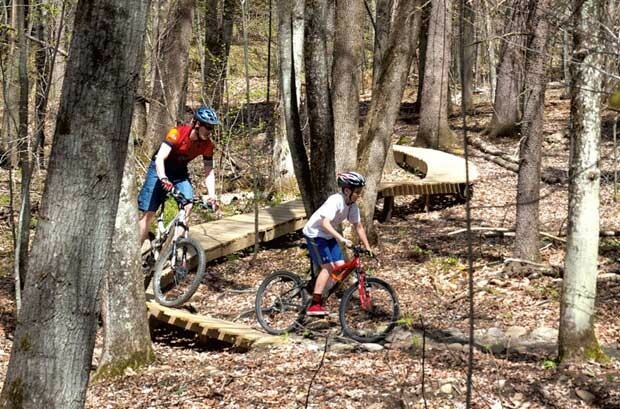 Kieran, now 12, and Wylie, 8, took to bike riding early and are now fully capable of tackling Vermont's twisty, rocky and root-filled mountain-biking trails. For our first ride this season, we headed to the Saxon Hill trail network that runs through town-owned land in Essex. Built and maintained by the Chittenden County-based nonprofit Fellowship of the Wheel, it has attributes that appeal to every member of our family. There are easy sections of smooth and flowing single track, as well as terrain complicated by roots, rocks and steep jump sections. Back on the bikes after a long winter, we never know how enthusiastic the kids will be once their quads start burning. So we aimed to take the first lap easy. We all followed Gabe up the hill on a single-track trail with some exposed roots. For those of us over five feet tall, it was an easy climb. Not so for Wylie, who struggled to keep moving as we went over the roots while biking uphill. The whining started earlier than I had expected. I got off my bike to give him a boost. I know how hard it is to get going again when you stall on an incline. About halfway up the climb, we came to the first bridge section. It's a newer feature that skips over a section of trail that's notoriously soggy. By the time Wylie reached the bridge, he was out of breath and low on confidence. I told him that I always walk tricky sections the first time I see them so I can scope out the terrain. We both dismounted and carefully balanced our bikes next to us as we walked the length of the narrow and curvy platform. When we stopped for a break at the end of the bridge, I noticed that Wylie's seat was too high — he was on his tippy toes when seated. A little saddle adjustment had him feeling much more comfortable. I could tell because he rode back and forth on the next short bridge section about eight times. Nearly to the top, we were all eager to end the climbing part of the ride and begin the fun part — going down fast. 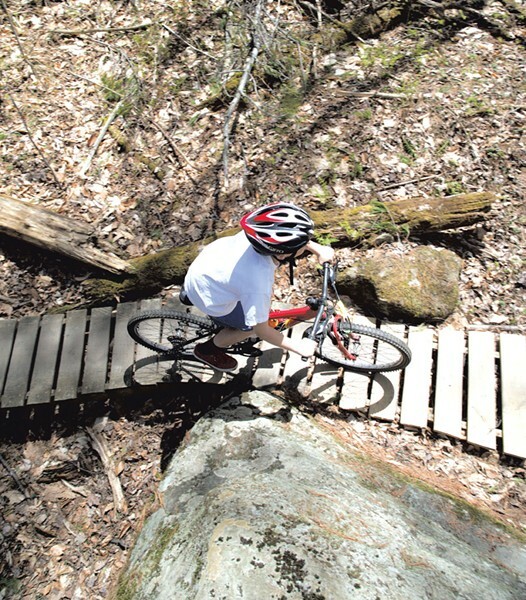 Gabe chose a trail with lots of jumps; those of us feeling not so brave could steer around the earthen ramps. Each of us zoomed down the speedy but short section and met at the bottom of the trail with big smiles. After a confidence-boosting descent, Wylie arrived at the bottom saying, "Which trail are we riding next?" We headed to some easier trails with smooth, swerving sections, few exposed roots and rocks, and very little elevation gain. I was just getting into the groove of the tight, fast turning when I almost ran over a garter snake sunning itself on the trail. Seeing a wild snake up close was probably more important to either of my kids than the bike ride. So I yelled, "Snake!" and jumped off my bike to track it through the leaves. The boys came quick to see the little reptile as it stared warily back at us. At this point, we all considered the outing a great success. In other words, it was the perfect time to call it quits. We headed back to the car before anyone could start grumbling about being hungry or sore. The crew had little interest in another meal — we'd had a late breakfast — but everyone was eager for a treat. We headed to Palmer Lane Maple candy store in Jericho for maple creemees topped with maple sprinkles. Licking our frozen desserts in the sunshine, it occurred to me that I had arrived at an important destination in my parenting life. My children can now experience and appreciate outdoor adventure sports with me, and it's not yet embarrassing for them to be seen mountain biking with mom. I'm enjoying it while I can. The Saxon Hill trail network has been caught up in land-dispute negotiations for a couple of years. Though there are visible trails to the right of the access road, only the paths on the left side are open to the public. Obey all posted signage and check the Fellowship of the Wheel website for updated information on trail conditions before you head out. Palmer Lane Maple candy store is just up Route 15 in Jericho. They make perfect maple creemees — but it's the only flavor they offer. Jericho Café and Tavern, also on Route 15, serves sandwiches, salads, baked goods and homemade soups. Outdoor tables on a covered porch mark the ideal spot for an après-ride nosh. Joe's Snack Bar, on Route 15 across the street from Jericho Café and Tavern, is a well-loved seasonal fast-food joint serving fries, burgers and other battered classics. They've also got creemees. It's a casual place with outdoor picnic seating that's open from May through October. Jericho's Mills Riverside Park is a picnicker's heaven. A covered bridge takes pedestrians over the Browns River and onto an expansive lawn that's perfect for tossing a Frisbee. Just beyond it are wooded trails, a post-and beam pavilion and impressive views of Mount Mansfield. Find more information at millsriversidepark.org. Why do so many children's stories revolve around kings and queens, princes and princesses? I want my kids to have heroes who weren't born into some royal family. Graham and Ivy Resmer posing with "Ethan Allen"
For the last few months, I've been telling my 8-year-old son, Graham, and 5-year-old daughter, Ivy, stories about the American Revolution. Granted, I don't know all the particulars, but I know enough to pique their interest. After I regaled them with the story of Ethan Allen's 1775 raid on nearby Fort Ticonderoga, they asked if we could visit sometime. Music to my ears! On opening weekend of the fort's 2014 season, my partner, Ann-Elise, and I drove them to New York for a tour of the historical site. We brought a picnic: hummus, mango slices, strawberries and cereal bars. On our way to the Crown Point Bridge, we picked up the final ingredient — a fresh loaf of crusty bread from wood-fired bakery Vergennes Laundry. We arrived at Ticonderoga in time for a guided tour at 10:15 a.m. One of the fort's Revolutionary War reenactors served as our guide. He and his compatriots were there to replay the Green Mountain Boys' attack and its aftermath; the day before had been the 239th anniversary of the event. "Gordon," was dressed in a blue coat, breeches and a trifold hat; he sipped coffee from a tin mug. He recited the site's history to about a dozen visitors who gathered outside the fort. Several of them were young kids who seemed a little bored by his lesson. Ivy ran around picking dandelions while Graham played with the grass. Fort Ti was originally a French military installation. Construction on what was then called Fort Carillon began in 1755, he said. The British captured it in 1759 and renamed it. By 1775, Fort Ti was a sleepy outpost guarded by just 40 British soldiers. The Green Mountain Boys changed that. Gordon's description of their famous raid managed to capture everyone's attention: In the early morning hours of May 10, 1775, a group of about 80 Green Mountain Boys, led by Benedict Arnold and Ethan Allen, stormed the fort. Gordon told us that the British sentry saw them coming and tried to shoot, but his musket misfired and he fled inside. The rebels barged in after him. Their successful offensive, three weeks after the battles at Lexington and Concord, was the first American victory in the Revolutionary War. Gordon's monologue was interrupted by occasional whoops and hollers from behind the fort walls — the Green Mountain Boys, he explained. "After they captured the fort, they found the rum supply. They've been into that all night." Gordon led us into the fort, where we saw a group of them pushing around a British soldier and dumping water on him. The kids watched, wide-eyed; I think they were a little scared of the rowdy reenactors. Gordon confided that they were indeed a lawless bunch of farmers, from what would soon be called Vermont, who only took orders from Ethan Allen. We concluded our tour just in time to see a musket demonstration. A group of "soldiers" brought their weapons outside the fort and explained how to load and fire them. This was one of the highlights of the day for my kids. We sat right up front; it was really, really loud. Afterward, we wandered along the battlements; the kids climbed on the fort's replica cannons. Ivy was hungry by then and began scoping out picnic spots. But Graham was into walking through the barracks, which have been converted into a museum of artifacts. Upon entering a room full of arrowheads and models of the fort's construction, he exclaimed, "This place is really neat!" I thought so, too. The best part for me was telling the kids the story of Colonel Henry Knox, a 25-year-old Boston bookseller, who helped turn the tide of the Revolutionary War. After Ticonderoga fell, Knox and his men hauled 59 captured cannons from the fort to Dorchester Heights, Mass., in the dead of winter. It took them two months. One of the items on display at Ticonderoga is a painting of their daring, 300-mile journey. After the troops arrived, they took a single night to mount the cannons on a ridge overlooking Boston. The gunfire from the weapons forced the stunned British occupiers to evacuate the city. 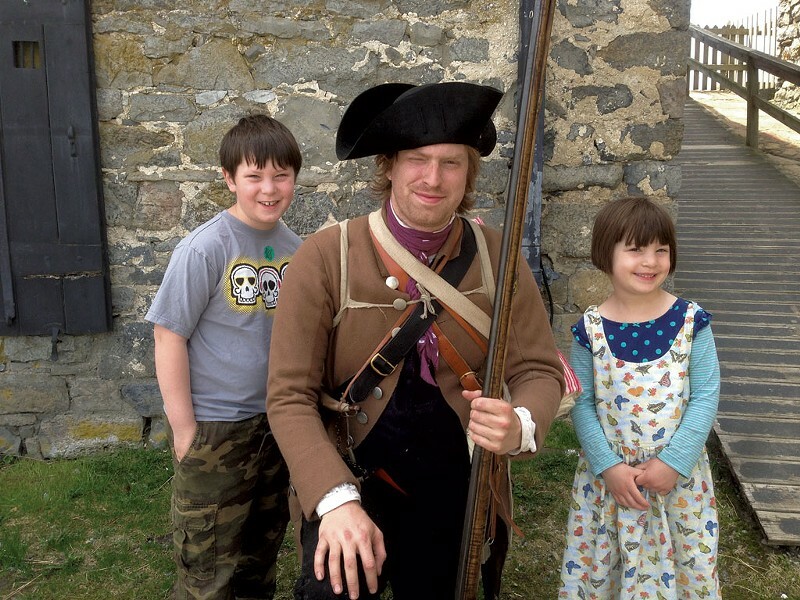 It's a story I could have told them anytime, but hearing it at Fort Ticonderoga brought it to life. I always forget that the drive to Ticonderoga isn't over once you cross the bridge. It took almost half an hour to get there once we entered New York. And the lack of signage was confusing. Spare yourself the headache and figure out your route before you go. Another surprise: Visiting Fort Ticonderoga isn't cheap. Our family of four paid $51 to get in. Admission is $17.50 for adults, $15 for seniors, $8 for children 5-12; children 4 and under get in free. Admission also gets you into the King's Garden, which wasn't open when we visited. 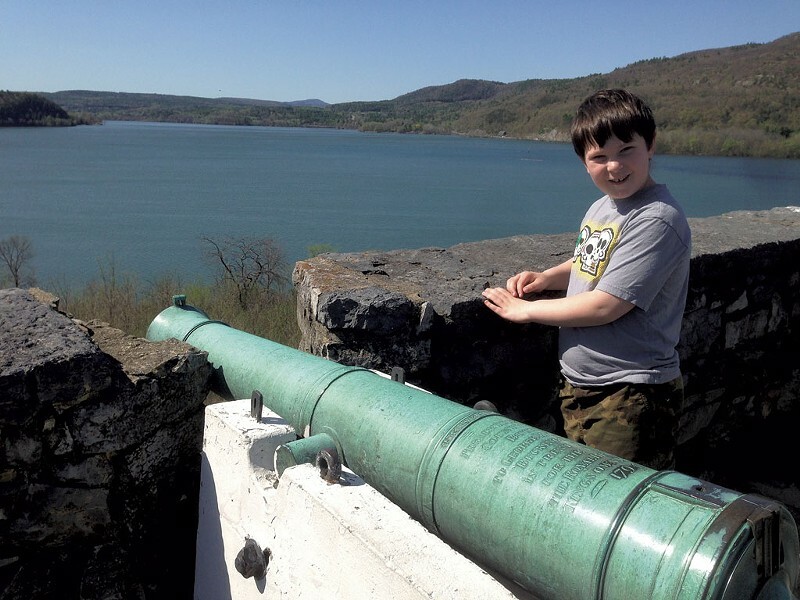 An additional fee lets you visit Mount Defiance, a hill overlooking Fort Ticonderoga. Vergennes Laundry is usually open Wednesday through Sunday, 7 a.m. to 6 p.m. at 247 Main Street in Vergennes. It's the perfect spot to grab pastries and coffee en route. Goodies snack bar — known for its large and inexpensive creemees — is on the Vermont side of the Crown Point Bridge. Fort Ticonderoga has a gift shop and café that serves lunch. There's also a picnic area. The Fort Ti complex includes a road to Mount Defiance. British troops mounted artillery there in 1777 and drove the Americans from the fort. Once you pay the entrance fee, you can drive up and park at the top. 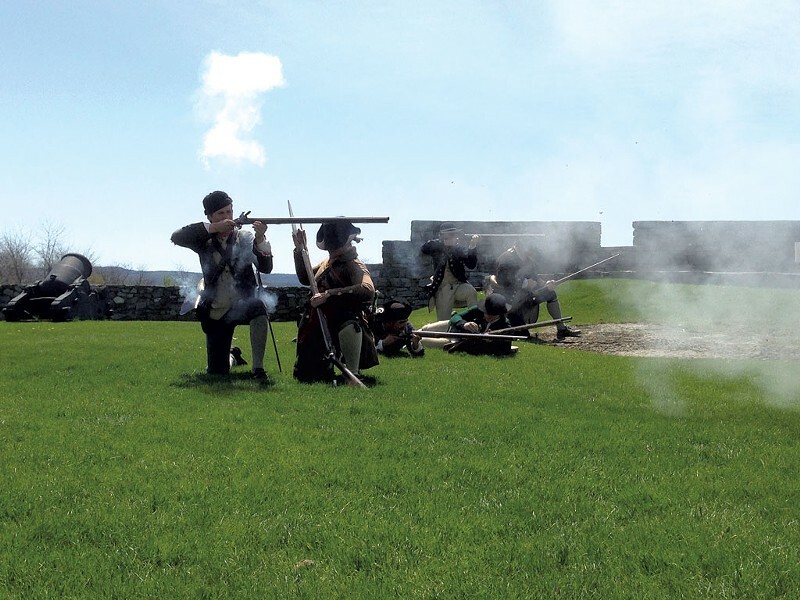 Find more information on the Fort Ticonderoga website. There's another fort nearby at Crown Point, on the New York side of the bridge. You can tour the ruins for free, but there's a small fee for adults to visit the museum at this historical site. The Crown Point Pier and Champlain Memorial Lighthouse are across the street. We stopped there to view the Rodin sculpture embedded in its side, just above eye level. It was donated by the French government in 1912, in honor of the 300th anniversary of Samuel de Champlain's "discovery" of the lake. Find more information at nysparks.com/historic-sites/34/details.aspx.